If it is true that you are only as good as your last race, then Auckland’s Toby Summers is very good indeed. 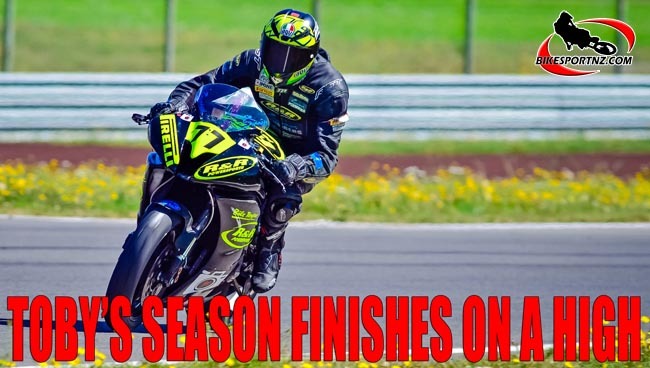 The 42-year-old Manukau plumber took his R&R Powersport Yamaha R6 to dominate the 600cc Supersport class at the fourth and final round of the New Zealand Superbike Championships at Taupo at the weekend and all he could say about it afterwards was: “Well, it’s about time”. His campaign had been blighted by bad luck and, as he arrived at Taupo last Friday to prepare for the big weekend, he was fifth overall in the 600cc Supersport class, a far from satisfactory position for a man who typically runs with the leaders in this class and had finished second overall at the nationals last season. But, after finishing the weekend at Taupo with a 2-1-1 score-card over his three races, he emerged with a New Zealand ranking of No.2, albeit still finishing the series 92.5 points behind new champion Alastair Hoogenboezem, the Christchurch Suzuki GSX-R600 rider who is 20 years Summers’ junior. “I got the lap record in race one on Saturday, even though I finished second (to Hoogenboezem). Then, in the next race, on Sunday morning, I broke the lap record three more times and won the race (ahead of Hoogenboezem),” explained Summers. Summers broke the lap record two more times as he won the final 600cc race of the weekend. “I knocked seven-tenths of a second off my previous record and I did that on the last lap to take the win,” he grinned. “My record time was one minute 30.174 seconds, which wouldn’t actually be a bad time for a 1000cc superbike. “To go from fifth overall at the start of the day to end up second … I was lucky to do that … well, luck and maybe a little bit of skill eh? “Unfortunately, it was too little too late to help my title bid. I should have been doing this earlier in the season but I had all sorts of problems. I technically had three DNFs in the 15 races and, with it being just a short four-round series, you can’t afford that. This year was only the third season Summers has campaigned the 600cc class and, remarkably, he has now twice consecutively finished No.2. He also won the F2 (600cc) class in the pre-season Suzuki Tri Series in December 2013. He says he’s not sure whether he’ll give the 600cc class another crack in 2016, hinting that the 1000cc Superbike class might be his new playground. Summers is supported by R&R Powersport, Bike Torque Yamaha, BikesportNZ.com, Summers Plumbers, Bitubo, Pirelli, Beta Tools and Mad Love Media.